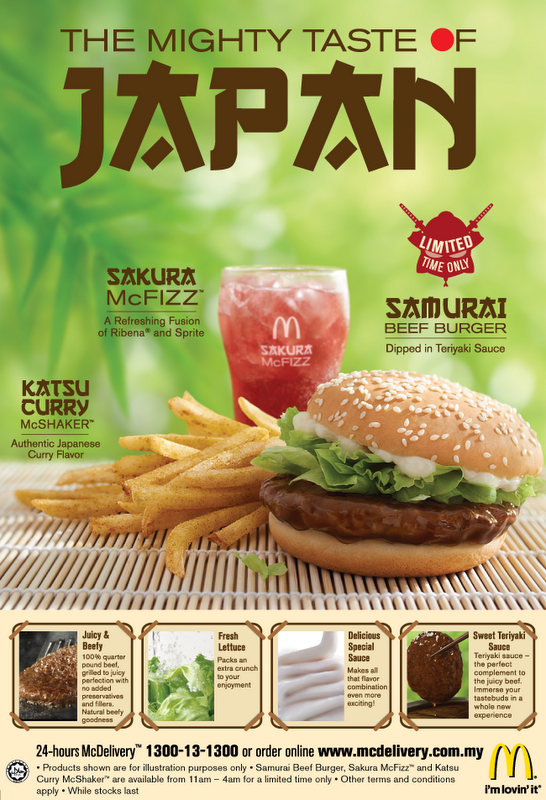 "RM0.00 McDonald's: Discover the Mighty Taste of Japan with our NEW Samurai Beef Burger! Complete your meal with Katsu Curry McShaker fries & Sakura McFizz. Oishi!" "RM0.00 McDonald's: The Might Taste of Japan with our NEW Samurai Beef Burger starts 20 Sept! Complete your meal with Katsu Curry McShaker fries & Sakura McFizz"
Ah, that explains it. Then moments ago, I received McDonald's newsletter. And it's confirmed with their Facebook page. It's out! So like, the NEW Samurai Beef Burger is a quarter pound of 100% beef, grilled to perfection and smothered with sweet teriyaki sauce (scream now!). Beefy and juicy with every bite. ;) Okay, the illustration looks really good. Imma trying the burger soon, hopefully it's as good as how it looks! I tried already. Honestly can't taste the teriyaki part. It's like the normal quarter pounder meat in a sauce that was "unrecognizable". The drink is actually sprite + ribena haha.